Into the Trenches! 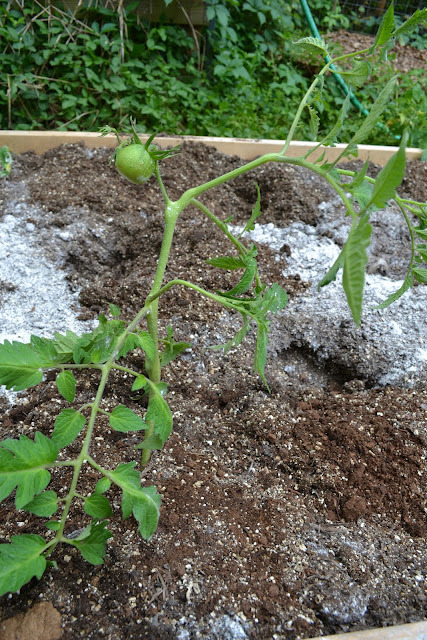 How to Trench Plant Tomatoes. You know the adage about the shoemaker's children? The same holds true for the gardens of nursery owners. Our first responsibility is to ensure our green babies thrive and find happy homes. Then, and only then, can we take a moment to put our own selected babies to bed. Spring 2012 wrecked havoc on my plants...and my nerves. The seedlings grew beautifully in the new greenhouse—lush and full of promise. But then, our spring vanished in a blink, and we faced unseasonably warm temperatures. Those lovely little seedlings became behemoth, towering monsters...far too early. Yes, I—like most gardeners—was excited about the prospects of early tomatoes. But then, suddenly, the plants grew too large to ship. Or transport to market. I sold what I could, gave away plants to friends, and searched for community and school gardens to donate the plants. After hours and days and weeks and months of work...the majority ended up in the compost pile. This is a tale of how you can take a too-tall tomato plant and turn it into a strong, healthy, fruit-producing machine! I admit, this is the first year I've tried trench planting tomatoes. I've never needed to contend with ultra-tall plants before. 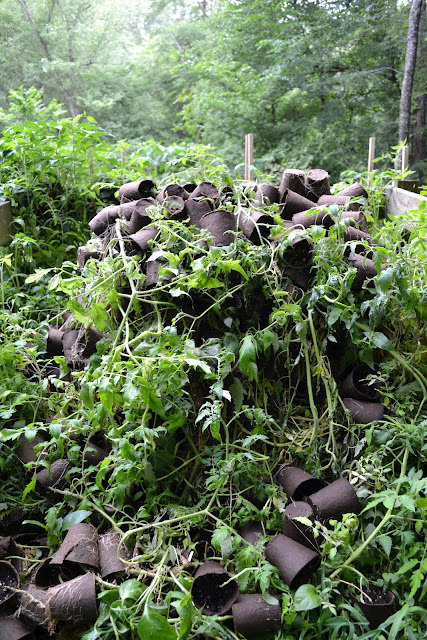 However, I've always been a believer in planting tomatoes as deeply as possible to develop a strong root system. Trench planting embraces the same premise. The tiny hairs along the stem of the tomato plant will develop into roots upon contact with soil. By planting more of the stem underground, you're providing more opportunities for root development. By growing more roots, the plant can absorb more water and nutrients to produce a greater crop. And—the additional roots provide a sturdy support, bracing the plant against strong winds and storms. Trench planting is ridiculously simple. Step 1:Remove the plant from the container—unless it's grown in a biodegradable pot, like I use. If your plant sports a biodegradable pot, tear off the top lip of the pot to the soil line. Step 2:Dig a trench approximately 4 inches deep, and as long as your plant is tall. Step 4:Place your plant horizontally in the trench, gently bending the top portion of the plant upward. Be careful not to pull too hard, or you might snap the stem. Step 5:Cover the root ball and stem with soil, gently firming the soil around the plant. The top of your plant will lean a bit—but as the plant adjusts to its new home, it will straighten. Step 6:Stake your plant. Remember—you want to keep those leaves off the ground to prevent disease. Also—remember to water consistently. My rule is: stick your index finger into the soil, approximately one inch deep. If it's moist—don't water. If it's dry, time to water! Inconsistent watering also leads to disease and poor tasting fruit, so make certain to keep those babies hydrated. While we're on the topic of water—avoid wetting the leaves, which also can cause disease. Drip irrigation is best—it allows the water to get straight to the roots. as fruit sets, and then I feed them again about every two weeks throughout the season. , the numbers you see on commercial fertilizers: N = Nitrogen, which promotes tissue development and big, green, leafy growth. Too much nitrogen, and you'll have a lovely plant—with no fruit. P = Phosphorus stimulates root growth and helps the plant set buds and flowers. This is key in developing delicious tomatoes! K = Potassium improves overall vigor of the plant. It helps the plant make carbohydrates and provides disease resistance. The key to selecting an organic fertilizer is to choose one with a higher “P,” such as 5-10-5. So, my gardening friends, your tomatoes will have strong roots, adequate calcium and water, and enough good nutrients to produce delicious summer harvests for your dinner!